The Campagnolo Chorus chain delivers Record level performance at a slightly heftier weight. While the two 11-speed chains are identical in every respect, the feather weight hollow pins of the Record model have been replaced with a more traditional solid pin design. Ultra Shift link profiling offers flawless performance with Campy cassettes and chainrings while Ultra Link construction and Ni-PTFE anti-friction treatment ensure maximum strength despite its extra narrow design. Compatible with Campagnolo 11-speed systems only. 5.5mm wide. 256g (114 links; 2.24g/link). 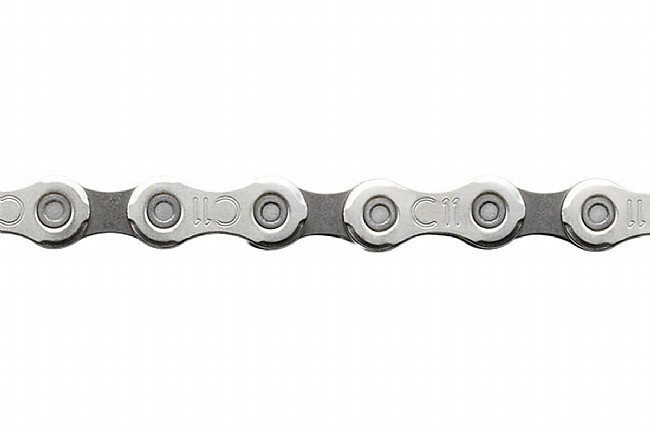 Note: This chain requires the use of Campagnolo UT-CN300 or the Park Tool CT-11 tool for proper installation. Can't see much value added in buying a Record chain, except the looks cool factor on my otherwise Record 11 equipped Pinarello Opera. This chain works great. I used the KMC link to connect it with no issues.